The Pompano Beach shuttle offers transportation to many cities in the state of Florida including major cities such as: Miami, Orlando, Ft Lauderdale, Cocoa Beach and many more. Also providing transportation service to major airports and seaports. Our Pompano Beach airport shuttle and city shuttle service, offers daily shared shuttle transportation and private transfers to different destinations including our shuttle from Pompano Beach to Orlando, the Pompano Beach to Port Canaveral shuttle transfer and the shuttle service from Pompano Beach to Miami airport. Also, to West Palm Beach airport, Melbourne Florida airport, Orlando airport, hotels and private residence. Travel with comfort and ease with our most economical shared shuttle transportation from Pompano Beach to all the major cities through East Coast (i-95) in the state of Florida. Our Pompano Beach shuttle bus runs 7 days a week. Our Pompano Beach private transfer is the most flexible transportation service that offers a door to door option from Pompano Beach to anywhere in Florida. Also, you can choose your own time of pick up. It's like having your own chauffeur at your own time. The Pompano Beach shuttle provides ground transportation from Pompano Beach to all the major cities in the state of Florida on the East Coast. There are few other Pompano Beach ground transportation companies that departs an hour later or earlier depending on their own schedule they work on and it also depends on which part of Pompano Beach they use for the pick up. Based on the Pompano Beach shuttle bus service you choose, there will be different routes that almost all ground transportation companies use for their transfers. If you need to use the shuttle service from Pompano Beach to Port Canaveral Or to Orlando, you will be traveling through I-95 or Florida's Turnpike. 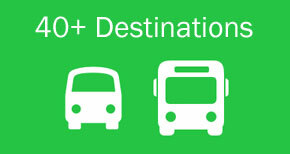 Always keep in mind that, the above mentioned routes depend on the type of service/trip you choose. Currently we are not offering door to door services with our shared shuttle service. However, in any case you can always give us a call to let us assist you better in your need of door to door transportation. Should you require further assistance about our Pompano Beach door to door service, you can always give us a call at 407-512-6606 and one of our friendly Customer Care Representative will guide you through. Pompano Beach, FL nearby airports: Fort Lauderdale International Airport, Miami International Airport and West Palm Beach International Airport. We also provide shuttle services from Pompano Beach to Orlando International Airport (MCO), Orlando Sanford Airport and all major cities in the state of Florida. Florida is not only popular in USA, but also across the globe because of the amazing theme parks, lakes, sightseeing places and of course the soul soothing beaches. Not only visitors, but also locals residents love to visit different places within the state. You can find lots of fun destinations to visit here. Therefore, if you're searching for a place to go and to find out things to do there, we invite you to visit the Pompano Beach Official site. Have fun and Bon Voyage! In case you need to know more about Pompano Beach FL and its many historical places to visit on your vacation, you may visit Pompano Beach Wikipedia for more information about Museums, historical places and fun spots.